and i do want to buy Jah Tubby's - SynFex - Syndrum Sound Effects Unit but with no luck tryed to contact them loads of times with no luck tryed last year aswell thay dont respond to you! can anyone give any info on them who can i contact! or if thay still build them or is it thay dont want to sell us them! go to velleman's website too..
ocoughi iv posted some pics to give ya a better idea and did check out that site look good! but still wonderin if i can get this one up n running so how do i find the line out and how to find where to connect the power? well,well... the trimmer on the right is the volume trimmer isn't it? if so then the middle leg of it must be the line out(+). then you have to search the ground, on it you'll connect your line out(-) and the Voltage(-), it must be another leg of the volume trimmer, i think it's the left one. all the push buttons have a common line in the circuit, this line is connected to the ground too! so if you follow it you'll find the ground. i don't see the voltage(+), do you have a photo of the other side of the circuit? Can anyone confirm my theory? thnks for your help much appreciated! the little white plug with 3 legs is the only link between this circuit and the circuit of the mixer isn't it? so it has the 3 functions: the sound of the siren (line out (+)), the common ground (voltage(-) and line out(-)); and the voltage (+). it's a spare piece or you took it from a broken mixer? 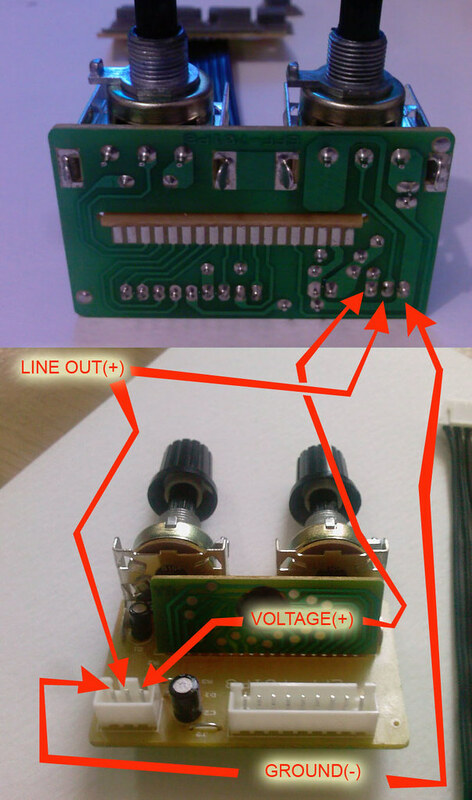 1st ye took it from broken mixer..you are 100% right man about the little white plug i had the the lead thats fits in there aswell and just like you said on pic i connected power of a 9volt battery + to the line out + then to the right pin in pic ..then - power battety and line out - to right pin in pic to a 1/4 jack..then just leaves the ground wire the one on the left side on pic but were does that wire go?? ..i av tried it to a delay and sorted well cool little dub siren just need a battery box ,rubber feet and a housing to put it in and a logo! just wanna say big thnks for helping me much appreciated and nuff respeck!! it works without ground? sorry if i misunderstand but you wrote that it worked with a different wireing than the one i drawed?? nah man watt u drawed was right its me prob the way i rit it! and ye works without ground! so wud the ground be wired to inside of the housing box? or not cus ive put it in a plastic box from electronic shop! big up fi ya help! Well, the "ground " has a lot of mistery for me! normaly it's connected to the (-) of the jack output and the (-) of the power transformer; thats the way i do and that the way a lot of hardware are made. BUT, a lot of hardware had a ground switch (on/off), so it can work without the ground connected. So whats the real use of the "ground"?, i don't really know. the only thing i'm sure is that some bad noises can be generated when the ground is switched to on or off. i would suggest to try the two solutions and choose the better one (if you can here some diference between the two options).